1. Limits: Limits on the number of packets that can be borrowed are sometimes in place and often range from 3-6 packets. This could also be per season or per year. This system probably work more if the seeds are checked out either through the public library system or by a representative of the seed library. 2. Unlimited: Some libraries allow an unlimited number of packets and request folks take only what they need. It's often recommended that people take 2-3 seeds per plant they intend to grow this season. For example, for 2 zucchini plants a person would take 4-6 seeds. If seeds are really small, then a pinch of seeds is what is a recommended quantity. Signage here educating members about quantities is key. 1. Self-Serve: Consider how much on-going commitment you are interested in making to maintaining the library. If you are all volunteer, then a self-serve honor system may be more sustainable in the long run. The Bay Area Seed Interchange Library (BASIL) is the oldest seed library and is all volunteer. Their self-serve system has allowed them to run with minimum volunteer hours since 1999. 2. Cards: If you have unusual things in your collection and are focused on genetic preservation, then an open system may not be the best to maintain your collection. If you decide to check out seeds with a library card, then there has to be a lot of extra time involved from repackaging seeds, making labels for all of those packages, getting bar codes (if it's part of a library check out system) and connecting that information to the library system. These on-going commitments need to defined and supported by public library administration or your organizing group before a deciding on this system. Another consideration to make with repackaging is population sizes. If only 4 peas are put in a package, then folks are going to want to eat all of their peas and not save many (or any) to return. In addition, the population size in terms of genetics is too small and may cause some problems a few generations out depending on the species. 1. Paper: A binder or some way of keeping membership check-outs on paper is by far the easiest system to set up. a. Check Out Procedures Overview: Have a paper in the beginning of the binder and perhaps elsewhere in your library to orient people on how to check out seeds. Here is a nice example from the Cape Cod Food Hub Seed Library in Massachusetts. It's helpful to make a Google spreadsheet with members' information, such as name, email and volunteer interests. Put a check at the top corner of the membership form once a member has been entered into your database. The advantage of making your list as a Google spreadsheet is that multiple folks can update the membership list. So more than one person can do it and if you are volunteer-based it's good to have more than one person with the access information. It is not worthwhile for most seed libraries to manually enter all seeds borrowed and returned. If you are interested in that, then use a computer-based membership process. a. Not Connected to Library System: There is a computer program that is being built that will be open source and available to any seed library. If you are on our email list, you will get a notice when that is done. If not you are not on our email list, take a few minutes to fill in the survey. Some seed libraries also have their list of seeds on the internet. Once again, ask yourself how much on-going volunteer hours or staff hours are we willing to commit to make this happen. If you are located in the public library, and there is a high demand for public access to computers, then you may have issues if folks try to use your dedicated seed library computer for other purposes. Make signs that clearly state that the computer is for seed library use only and is not for other purposes; this is especially true if the seed library is not supervised. b. Connected to Library System: A few libraries have pioneered connecting their seeds to the library database. Embedded in the code is a way to take them off the list so folks aren't fined. It does provide great data on what is being used. The Seed Libraries of Pima County Public Library (Arizona) have 8 seed library branches and inter-library loans throughout the county system via the computer. 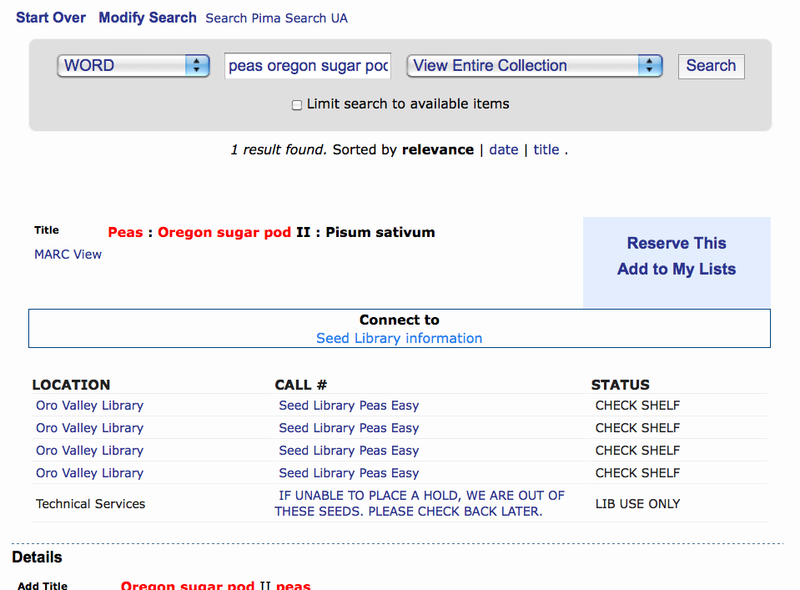 Below are some screenshots of the library search system from Pima County.